Tenorio Lodge is located between the Tenorio and Miravalles volcanoes, right on the border of Guanacaste and Alajuela provinces. It is located in the region of Upala, less than a 90 minute drive from Liberia (74.3kms/46miles) and a 4 hour drive (203kms/126miles) from San José. Located at an altitude of 500mts/1640 ft. above sea level, each of the Lodge’s 8 bungalows has an exceptional view of Tenorio Volcano. Rooms are spacious, elegant, and perfectly set out to provide the greatest comfort. This is an ideal place for birdwatchers and nature lovers due to its peaceful and undiscovered environment. The lodge offers a quiet atmosphere, relaxation, and serenity. Breakfast is served every morning from 7am to 9:30 am. Guests can relish in fresh French bread with butter and homemade jam, served with a fresh fruit salad, and accompanied by orange juice, delicious Costa Rican coffee, tea or hot chocolate. Local dishes are also part of the menu (Gallo Pinto, eggs and bacon, cheese, pancakes, etc.). Laundry services are also available at the lodge. There is free internet available at a computer station at the front desk as well as a Wi-Fi zone at the lobby, restaurant, bar, and terrace, for those who bring their laptop or smartphone. Guests can find games, guides books, and a gift shop of local crafts at the hotel. High baby chairs are also available at the restaurant upon request. Tenorio Lodge offers 12 spacious Bungalows. All rooms offers mosquito net, table, and armchairs (or a sofa bed to accommodate an additional person or two children), silent fan, bathroom equipped with a solar panel to generate hot water, and fire detectors. One room is especially equipped for handicapped guests. Six of the bungalows feature one King sized and six bungalows feature 2 Queen Sized beds, all with a 7” orthopaedic mattress. All Bungalows have a wonderful Tenorio Volcano view as well as private gardens. 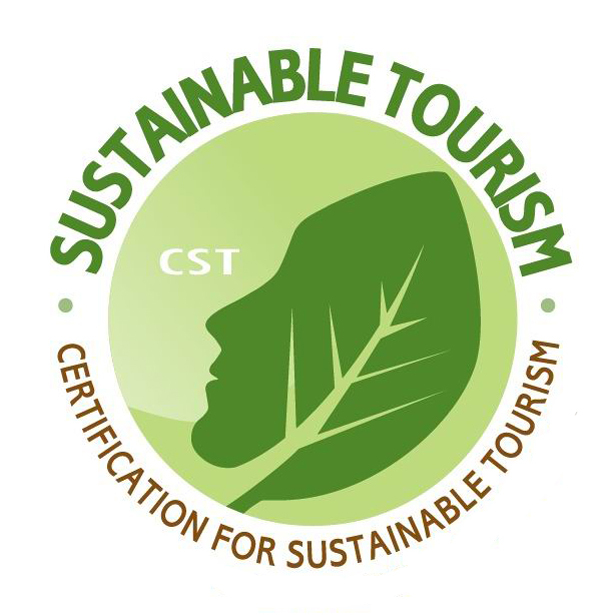 The Certification for Sustainable Tourism Program – CST – is a product of the Costa Rican Tourism Board and it is regulated by the Costa Rican National Accreditation Commission. The certification is based on an accreditation of a scale of 5 “levels” of sustainable tourism achievement. CST gives you reliable information regarding companies that make efforts to improve their management and operations to offer a sustainable product. It is also a good tool to differentiate those companies that are truly engaged with sustainable practices, from others that claim to be sustainable but are inconsistent in their actions. These measures are meant to be used as a reference only and they are calculated on double occupancy, standard room, quoted in U.S. Dollars and include a 13% sales tax; on both high and low seasons. You can always refer to these prices as selection criteria.